When it comes to keeping ourselves and loved ones safe, it’s never a bad investment to grab one of the best home security camera systems in the market to give us a peace of mind. Especially as technology continues to grow, we’re finding more and more affordable solutions for those who want a simple security camera or a professional camera system to make sure your safety is top-notch. Today we were interested in what was out there, and since the widespread of smart devices and wireless technology, are quite surprised at how high in quality these things are. 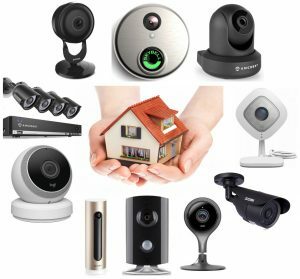 We’ve been able to narrow our search to 10 of the best home security cameras and systems in the market today; however, a few factors need to be taken into consideration before you choose the best for your own home. Money – Depending on a few factors listed later in this checklist, the amount of cash you’ll need for a solid home security system will start to add up. Keep in mind what you were thinking before reading, as well as remaining patient and perhaps saving up for a solution you think would be worth waiting a little longer for. How many cameras? 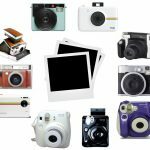 You can technically call a “system” consisting of only one camera with a receiver\your smart device\the camera’s memory. On the other hand, some may be looking for up to 4 cameras to cover numerous areas of their home. Many of these are sold not only separately but in packages as well, so that may steer your budget in a different direction after choosing. Wired or wireless? Nowadays, wireless anything is usually preferred, especially when it comes to these home security cameras. Most popular models out there are wireless, however some aren’t, so it depends on your preference. Indoor or outdoor? Or how about both? 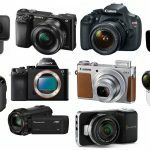 Where do you intend on placing your cameras? Make sure your intended model is compatible with the environment you foresee yourself needing to place it. If you’re unsure, we recommend grabbing an indoor\outdoor model just in case. 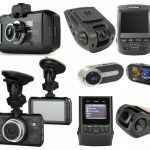 Additional features – Aside from our need to record or capture images, there are some extra features you may want in your system. The popular highlights some have include a two-way audio feature to speak to the individual you see\detect (or need for an intercom system), motion detection, infra-red lighting for improved night-vision, increased video quality, weatherproof, mountable, notifications, alerts, and more. We’ll list each model’s standout additives. To begin our guide, let’s take a look at the Netgear Arlo Q, in our opinion one of the best home security cameras with cloud recording that helps you monitor your home quite easily. Equipped with 1080p HD video resolution, the Arlo Q allows the user to have heightened visuals of their home, with some nifty features such as enhanced night vision and motion alerts (we’ve seen quite a lot of these cameras have difficulty in low-light environments). The smart motion alert gives an instant update if motions or sounds are identified, making it one of the best home security systems in terms of convenience. In addition, the Arlo Q has a 2-way audio system, allowing the user to both hear and talk to those nearby using the built-in mic and speaker (“Hey pizza guy! We’re in the backyard!”). 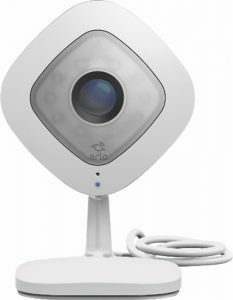 With an optional upgrade to CVR (Continuous Video Recording) for 24/7 coverage and an app that allows you to customize your experience using your personal schedules, the Netgear Arlo Q proves to be top of the line, and definitely worth the money if it’s within your budget range. 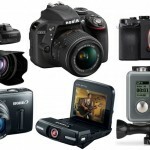 You also have a few package options if you need more than one camera to complete the exact system you need. 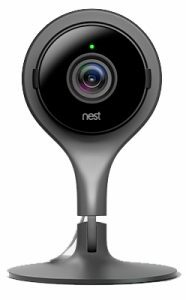 Next comes the super popular Nest Cam, a very easy-to-install system that provides protection in any area of your home as long as you can make it fit. Designed to be user-friendly, the Nest Cam uses a convenient light system to show you when it is on, if someone is viewing, or when someone is using the speaker to connect. A little chime from the mic and speaker connection will give you an update that someone is about to start speaking, allowing you to hear from up to 20 feet away. 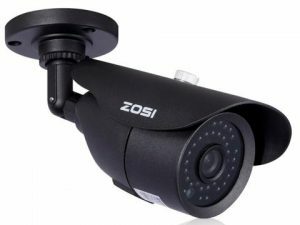 This home security camera also comes with 1080p HD quality and night vision, with the added bonus of a 130 degree wide-angle view of any room in your home as well as 8x digital zoom for closer inspection. With a live video feed that you can check in on at any time and the ability to use your phone’s location to turn your camera and the alerts both on and off, the Nest Cam home security system is definitely one to keep on your list. We recommend this if your budget is a bit bigger than the Arlo Q (you can grab a few of these if you need more than one for your system as well). 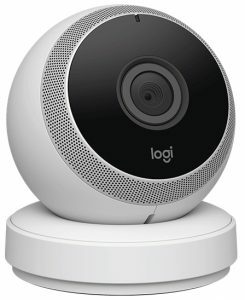 Engadget’s Nest Cam review lists some more pros and cons if you still need help deciding. Here’s more of a traditional “security camera system” solution some may consider since it comes with multiple cameras and a separate unit to record it all. A camera that connects to the DVR for a simple and effective plug-and-play system? Definitely an item worth looking into, especially if you aren’t digging the Wi-Fi and smart device app trend we’ve seen lately. With the Amcrest 960 H, you can watch your home in real-time on widescreen HD with some pretty decent quality image sensors. For specs, these cameras feature a 3.6 mm lens and a viewing angle of 75 degrees — not quite the 130 degree or even 180 degree we’ll see later on in this guide but it’ll get most jobs done. Combine that with the 24 IR-LEDs used for night vision and you have quality images to view at a distance of up to 65 feet away. This system also comes with customized motion detection, allowing you to set a perimeter zone on specific areas in your home, as well as set up a 24/7 schedule of when to arm or disarm the system. While the 500 GB HDD gives you access to record up to six days worth of video footage at high-resolution, this system gives you the option to record up to 30 days of video without running out of storage at a lower quality image in case you feel the need to do so. Add in the fact that the Amcrest 960 H can be used both indoor and outdoor, and you have one of the best home security systems on the market. 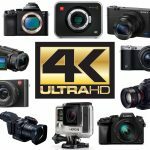 This will be a better bang for your buck if you needed a multiple-camera system as opposed to buying separate or even discounted packages of the other popular individual camera models. In a world where you can’t rely on just one form of communication, are you one to think it’s great when you find a product that updates you through texts, emails, phone calls, and push messages? In that respect, the Piper Home System may peak your interest. With a more new-age build and list of technology and specs, this one’s considered high-end for sure. Whether you’re at home, away for the day, or taking that much-needed vacation (we guess we’ll speak for ourselves), the Piper security system keeps you protected with a 105 dB siren (the intruder deterrent component makes this a must-have security camera), as well as motion and sound detection built into the system. The two-way audio system acts as a personal intercom within your house to make sure that everyone is on the same page in case you’ll need it for that as well. But what makes it one of the best home security camera systems out there and really justifies the price? That would have to be the 180 degree view it offers of the entire room, with an option to pan, tilt, zoom, or split your screen into independent viewing zones. With all of this available on your smart phone or tablet, the Piper NV security system makes smart arming easy. 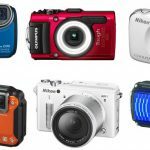 Although a bit more expensive than others, you’re getting a higher quality camera with some awesome additional features here if you have the cash. When it comes to finding the best home security camera system for you, size may be important. Aside from the sleek fit, there are two words you have to know that separates this one from the rest: face recognition. The Welcome security camera lives up to its name because of this feature, and makes a great case why this should be the system you are using in your home. Since it can name the people it sees (most of the time), it can send you a list of who is in your home directly to your smart phone, and quickly identifies when a stranger has decided to make an unexpected visit. Does this feature actually work as intended? Tom’s Guide’s Welcome review backs that up as a yes. As for that pesky notion of privacy that everyone is so worried about, Welcome also allows you cancel video recordings for different members in your household, leaving everyone feeling a little more protected and a little less like they’re on an episode of “Big Brother”. Best of all, it will only record when something is happening in your home, leaving you with extra time since you won’t have to fast forward through hours of blank video. With a 130 degree view, 1080p HD technology, and infrared LED lights for night vision, the Netatmo Welcome does a good job of earning its name. It has some of the most advanced features we’ve really seen thus far in this category, albeit for a decent price on top of it all. A wide-angle, 180 degree view allows you to see all images clearly on your live stream and recordings, not to mention a 360 degree rotation feature that places you in the more custom viewing position than a lot others out there. While the 6 infrared LEDs and a light sensor provide clear images for optimal viewing at night up to 16 feet away (not too far, but we’ll take it), the D-Link DCS-2630L goes a step further by using 2 PIR sensors motion sensitivity. These sensors pick up infrared radiation on those in your home, giving you even more visibility. The mic and speaker system provide you with two-way audio, alerting you to the sounds that are heard throughout your home. Lastly, you can stream to your devices or record the footage to your microSD card and leave the rest to the security camera itself. 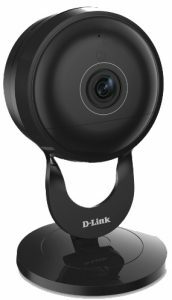 With all of this and the 1080p high-definition viewing provided in this camera, the D-Link DCS-2630L is easily one of the best home security camera systems available for those on a stricter budget without too many bells and whistles. With this little thing, you’re getting a bit different of a spin to a security camera, but it may be absolutely perfect depending on who you are. With 5x zoom on the HD video camera and monitor sensors, SkyBell gives you picture perfect clarity with 1080p HD, allowing you personalized viewing and notifications for whoever has arrives to your door. Like the others, it has a two-way audio feature from the built-in digital microphone and speaker that helps you converse with your guests no matter where you are with your smart phone or tablet. The device is also equipped with color imaging at night and can withstand whatever the weatherman may predict for that day, keeping your home safe at all times. Another great feature is the ability to turn your system into quiet mode, giving you a chance for some peace and quiet if you’re in the do-not-disturb mood. 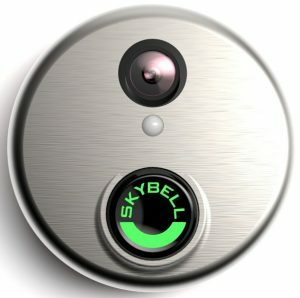 The SkyBell Wi-Fi Doorbell is a great device to help you see who is visiting your home before they even get to your door and is a little more friendly on the wallet as compared to other traditional home cameras. 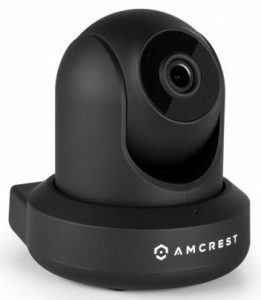 Aside from the lower price-point and decent quality it’ll give you, the installation is quite easy since it takes merely 60 seconds to set up your security camera with your device on the Amcrest View App (for most). You’re equipped with 1080p HD video streaming right to your smart device. Adding to the ease of having everything at the touch of your fingers, the Amcrest camera also gives you the option to receive push notifications despite your location so you can check in and see what details your alarm is presenting to you (we’d get a bit obsessive over it sometimes). If you have a specific area of your home that you want to watch, the ProHD gives you the ability to customize points of interest in your home. Combine that with 12 IR LEDs for OK quality night vision, a 360 degree view that you allows you to pan the room while tilting to your specified angle, and a 4mm lens that gives you a wide-angle of up to 90 degrees, and you have arguably the best home security system available in the lower-end. 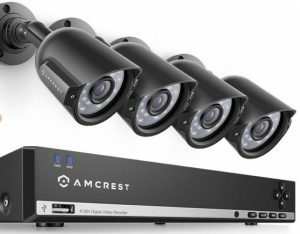 If you weren’t feeling the previous models and easy installation is on your list of priorities, then the Amcrest IP2M-841 ProHD is definitely worth looking at. You can also sacrifice some video quality for their lower model that’s a bit cheaper or grab one of their package deals if you needed a system of more than just one camera. For the people who are busy and realize that they can’t be in two places at once, Logitech Circle HD is a good one. Aside from a brand name many love, this nifty little device is perfect for families on-the-go, with a 1080p HD system that lets you view exactly what’s happening in your house in real-time. Can’t watch the video until the end of the day? Circle has the ability to take an entire day and turn it into a 30-second time-lapse, so you can catch up on just the major events. Another feature is that Circle can detect when you are home using the Smart Location feature and will stop sending you alerts and notifications while you are in your house. Also, to keep your phone from going off multiple times during the day, Circle uses Smart Filtering to reduce the amount of notifications and only keep you up-to-date when something important happens. A user-friendly device, Logitech Circle HD ranks up there with the others. We’ve also heard it used as a baby monitor or pet cam as well. Last but not least, we have a camera that can be mounted to a ceiling if you want a non-intrusive and less detectable solution. You’re getting a device that has three different recording options based on your preference, including manually choosing your recording times, scheduling your recording to view at exact moments when you need it, or recording only when motion is identified in the room (the motion sensor sends you an email alert to show when it begins recording). It’s also an indoor/outdoor combination security camera and is weatherproof in all different situations. The 3.6mm lens gives the option of having a relatively wide viewing angle (of up to 90 degrees), and with 24 LEDs you can have up to a decent 65 ft of image at night. The camera even does the work for you of automatically switching to night vision when it detects a change in light levels. The Zosi 960 H might be your new best friend, although it’s usually only available in packages of multiple cameras (which may even be a good thing if that’s what you need).